Welcome to the latest edition of Check-In for 2018! This newsletter is circulated free of charge every two months to all eSmart registered library services in Australia. We hope you make good use of it and if you think it would be beneficial, feel free to forward it on. It’s been a massive start to the year for eSmart with our partner program eSmart Schools being featured on the Sunrise program hosted by David Koch and Samantha Armytage. Described by leading child physiologist Michael Carr-Gregg as world’s best practice, eSmart won widespread support, being praised for its evidence based approach and whole of organisation framework. eSmart Membership is the next step forward for libraries who have achieved eSmart status. Launching in July, it will offer the next phase of skills development to library staff and assist in supporting library communities to embrace technology safely and confidently. Contact us to find out more. 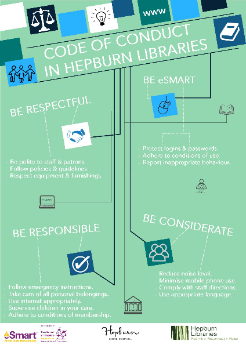 Ever since being launched by Port Adelaide, the one-page infographic code of conduct has become an iconic part of eSmart Libraries. See below for a variety of different designs that you are welcome to use at your own library. There have been many changes in libraries in recent years, however one thing that hasn’t changed is the vital role a library plays in connecting people with the information they need. With this in mind, Fraser Coast Libraries have created the eSmart 17 – an online brochure to help direct their customers to the best cyber safety resources. Q: The staff training modules have been a wonderful help. Is there any way of tracking which staff members have and haven’t completed them? A: The training modules don’t ask for any personal information so there is no way to know who has or hasn't completed it. You can however, use the information we have provided to cut and paste into your own trackable training management system. Alternatively you may wish to use the staff checklist, which allows them to tick off the modules as they complete them and sign their name at the end. 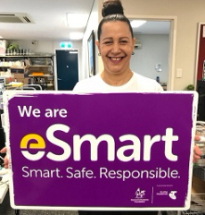 Broome Library has been active in incorporating eSmart into their daily activities, which is having a real and positive impact on their community. Our partnership with the Telstra Foundation was launched in August 2012 by the former Prime Minister of Australia, the Hon. Julia Gillard MP. The $8 million, multi-year partnership with the Telstra Foundation is delivering eSmart Libraries. The Framework is being provided in collaboration with Australia's library network to all of Australia's 1,500 public libraries. eSmart Libraries is now in 75% of public libraries across the country. 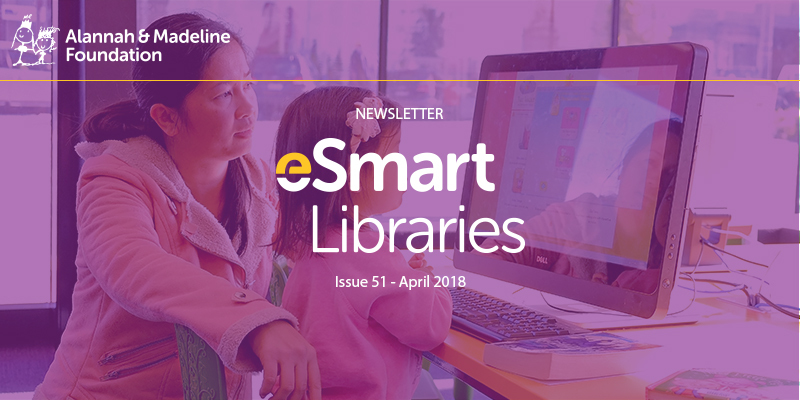 You are subscribed to receive the eSmart Libraries bi-monthly newsletter. Click here to unsubscribe or to change your Subscription Preferences.